Basing his contention on two different lines of argument, Michael Bryson posits that John Milton-possibly the most famous 'Christian' poet in English literary history-was, in fact, an atheist. First, based on his association with Arian ideas (denial of the doctrine of the Trinity), his argument for the de Deo theory of creation (which puts him in line with the materialism of Spinoza and Hobbes), and his Mortalist argument that the human soul dies with the human body, Bryson argues that Milton was an atheist by the commonly used definitions of the period. And second, as the poet who takes a reader from the presence of an imperious, monarchical God in Paradise Lost, to the internal-almost Gnostic-conception of God in Paradise Regained, to the absence of any God whatsoever in Samson Agonistes, Milton moves from a theist (with God) to something much more recognizable as a modern atheist position (without God) in his poetry. 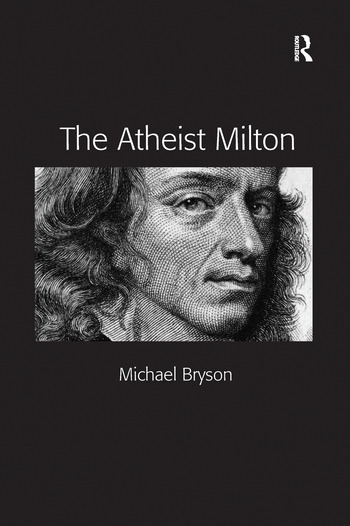 Among the author's goals in The Atheist Milton is to account for tensions over the idea of God which, in Bryson's view, go all the way back to Milton's earliest poetry. In this study, he argues such tensions are central to Milton's poetry-and to any attempt to understand that poetry on its own terms. Contents: Introduction: an unexpected journey; Atheism by any other name; The apophatic Milton; The gnostic Milton; The atheist Milton; Bibliography; Index. Michael Bryson is Associate Professor of English at California State University, Northridge. He is the author of The Tyranny of Heaven: Milton's Rejection of God as King. He has also written on the relationship between sacrifice, death, and community formation in the book of Judges (in Religion & Literature).